The Commerce Department yesterday released U.S. Personal Income and Outlays for December 2008. Among the published data, the one that caught my attention was personal savings rate. According to the report, personal savings rose to $378.6 billion in December from $299.1 billion in November. In terms of percentage, personal savings rate in December is 3.6%. 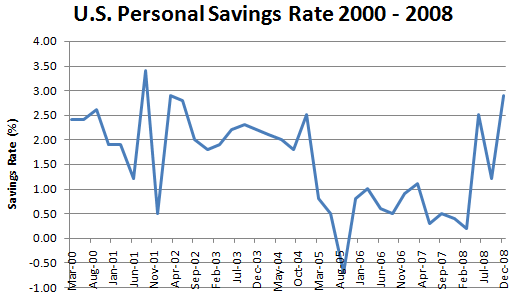 For the last quarter of 2008, personal savings rate is 2.9%, the highest level since the third quarter of 2001. While the increase in personal savings is encouraging (we have heard a lot of warnings that the nation’s savings rate is just too low), what will it do to the economy that’s already in deep recession? There are arguments that with people being frugal, the ression could be prolonged. On one hand, the econonmy, which relies on consumer spending, can’t recover if people start to save every penny they earn; on the other hand, with millions of workers lost their jobs and home foreclosure rate on the rise, it just doesn’t make sense to expect people spend as they used to. So is the increase in personal savings a good news or bad news? Yeah it’s an interesting conundrum. Consumption is 70% of the economy. Savings had been in the tank. Now the way out of this is to repeat what we were told to do from 01-03 and spend spend spend. But that’s what got us here in the first place….Fascinating. I’m not too shook up by this news. If the average savings rate in the United States is 3%, that is probably a good thing, as it will prevent more financial hardship in the future. Remember 15% is what people should be aiming for (at least I am). The population is way out of control. Over 1 billion people have no access to fresh water. When will you agree with me? When we have 10 billion on this planet? 100 billion? or a trillion? It’s pretty simple, when people are feeling good about their circumstances, they spend more. When people are worried about their futures, they save more.